“From when I was very young, I realized the thrill of helping someone – of saving someone’s life,” said Junesha. Her grandmother’s husband was a doctor and he often told stories about helping his patients. It was from this early age that Junesha hoped to help others in the healthcare field. Junesha originally wanted to pursue a nursing program in New York City. She was ready to start the program. But then, she was told that there was a problem with her financial aid. Junesha had to put her dream on hold. With HeartShare St. Vincent’s American Dream Program, Junesha was able to enroll in and graduate from a 15 month medical assistance training program. “I want to tell youth why the American Dream Program is so valuable. It’s your tuition. It’s a monthly stipend and a MetroCard. It’s emotional support,” she said. Junesha speaks confidently about what she knows, like handling a phlebotomy or an EKG. “I’m ready to jump right in!” said Junesha, who currently is preparing for her licensing exams. 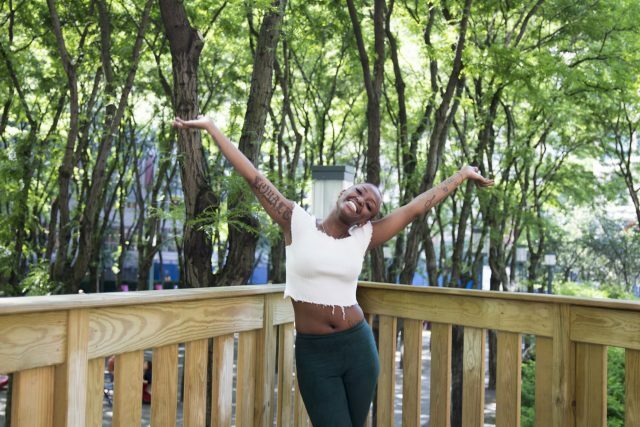 Junesha has battled more than exams and the rising cost of tuition in New York. “It took me a long time to get over it. To focus on and channel everything into what I wanted to accomplish,” shared Junesha. Junesha came into the foster care system at age 11. “It’s been twelve years,” said the 23 year old grad. Junesha was born in the U.S. and spent most of her childhood in Jamaica. In New York, she experienced physical, mental and emotional abuse at the hands of a parent. “I try to be very open about my story,” said Junesha, who volunteers as an ambassador talking to kids who have just come into care. HeartShare St. Vincent’s Services, at the suggestion of their youth, established a program to facilitate that mentor relationship. This is the kind of diligent care and attention to other human beings that Junesha will bring to her profession. While finishing up her medical assistant program, she had been working as Group Leader at the agency’s new after-school and summer youth program at Wyckoff Gardens. Junesha spent time planning and leading activities with the children, grades 3 through 8, including choreographing dance routines. What’s next for Junesha? “An Associates degree! And travel, travel, travel. I would like to go to Hawaii, Paris, Miami and especially Jamaica, to visit my relatives,” she said.